My family and I were just outside Sackets Harbor, NY for a Vacation/Family Reunion and discovered that we were only about 4 hours from Niagara Falls. So we decided to spend our last day in NY driving to and enjoying Niagara Falls. 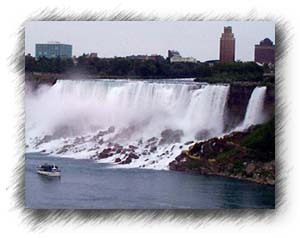 This photo is taken from the American side looking at horseshoe falls toward Canada. We arrived about 1:30 pm on a Saturday. It was a little cloudy. We walked down the steps to the crest of the falls. The roar of the water drowned out all sounds around us except for the people that were speaking very loud to each other to be heard. The mist would occasionally blow toward the crowd in a cooling breeze. Looking beyond the crest the mist gets very heavy. The water is moving about 22 miles per hour at the crest of the falls. Here you can barely see the visitors center on the Canadian side. 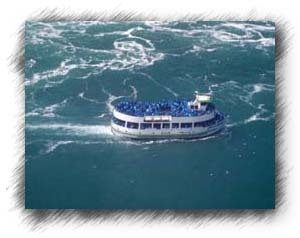 Here you can see a Maid of the Mist boat ride that gets you very close to the bottom of the falls and in "a lot of cool water" (mist). A little closer view of the Maid of the Mist boat. The boat is all blue because all the passengers are dressed in blue rain (mist) gear. If you go to the page with larger photos you can see them better. Looking from the same vantage point on the American side, we look toward the "American Falls". 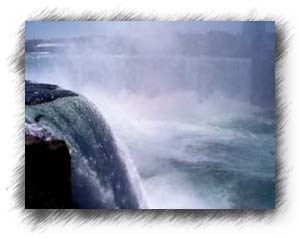 If you were on an aircraft looking down on the falls, you would see that there is an island of land in the middle of the Niagara River. 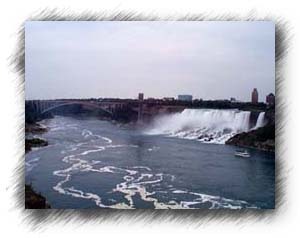 The water splits and forms the American Falls and the Canadian Horseshoe Falls. We are on that island viewing both of the falls. A short walk , still on the island, takes us to a better vantage point of the American Falls. From here we can walk down to the observation lookout in the foreground of this photo. 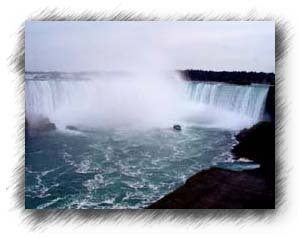 We have crossed over into Canada and are now standing again at the Horseshoe Falls. 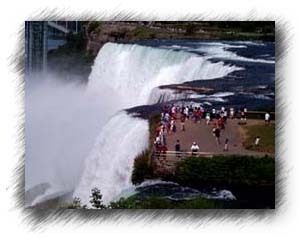 If you go to the falls in the summer, be prepared to wait in long lines ­ as much as 30-45 minutes ­ to clear customs when going from the US into Canada. As you can see, we lost some of our light and it is now almost entirely overcast. In fact, right after I took this picture, we had about a 30 second shower. Another look at the Maid of the Mist boat close to the falls. 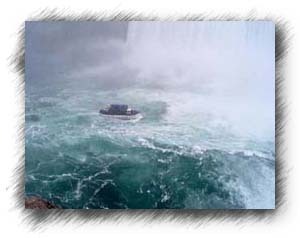 Here is a better idea of just how close to the bottom of the falls the boats actually get. 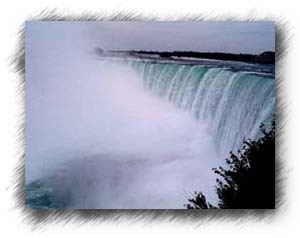 Even though you can get much closer to the crest of the Horseshoe Falls from the American side, the view of both of the falls is much better from the Canadian side. From here you can see the full horseshoe of the falls. That little dark thing at the base of the falls in the mist is the Maid of the Mist boat. Right under where this photo is taken is the outlet for the Hydroelectric plant that is here at the falls. From the same vantage point as the above photo, I turn to take this photo of the American Falls ­ looking back toward the US. 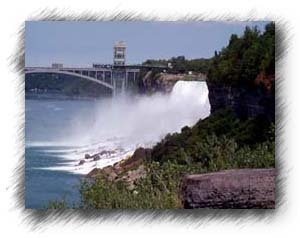 To the left of the falls you can see the Rainbow Bridge that crosses into Canada. 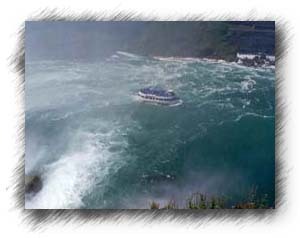 As the Maid of the Mist boat travels back from the Horseshoe Falls, it passes the American falls. It can not get as close to this falls as the other due to the rocks and debris at the base of the falls. If you look closely at this photo, and at the larger set of photos (click on any photo), to the right of the falls down close to the river, there are rows of yellow. These are people in yellow rain (mist) gear. 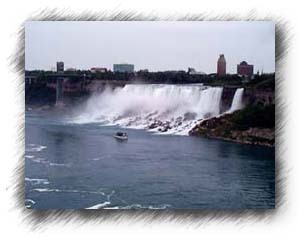 On the U.S. side at the American Falls and on the Canadian side at the Horseshoe Falls, you can get all geared up and take an elevator ride to the base of each falls. 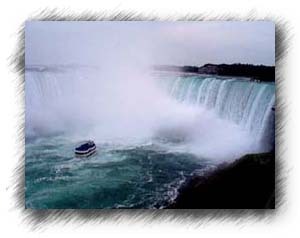 There you get the most close up experience of the falls from any vantage point. I regret to say that we did not have enough time to do much more than visit both sides and enjoy the spectacular views of the falls. 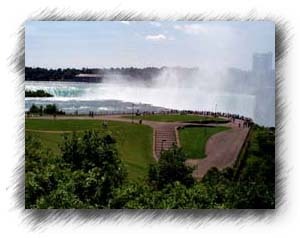 There are very many things to do while at Niagara Falls. 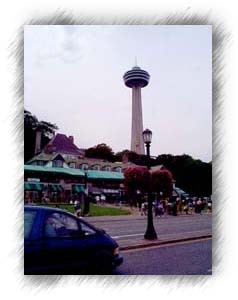 This is a photo of Skylon Tower and a little cafe/restaurant. We went to see if we could get a bite to eat before rushing off to Syracuse to catch a plane in the morning. 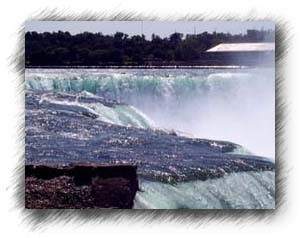 When I get back in that area again, I will make sure that I have at least a full day to enjoy and experience all the slender of the falls and the surrounding area and stay in the evening to see the light and laser show of the falls at night. Text and Photography by Gar Benedick. Copyright © 1999 Gar Benedick. Copyright © 1996-2008 Gar Benedick, All Rights Reserved.